Place the potatoes in large pot. Bring to boil, salt the water, cook for 5 minutes. Drain. In large skillet, heat olive oil over medium heat. Add potatoes to the skillet, rosemary, garlic powder, salt and pepper. Cook until lightly brown, about 5 to 10 minutes. Transfer to serving dish and garnish with Parmesan cheese. Enjoy! These potatoes look yummy. We still have rosemary growing in our herb pot on the patio, and we live in a suburb of Chicago. There's nothing better than fresh herbs. will have to make these potatoes. Thank you, Becky! I hope you enjoy. These would be great as breakfast or a snack! ooo, these look good, Christine. So nice and crispy! These looks sooo good! Rosemary and garlic are perfect on potatoes! I would definitely love to eat this any day :) Great recipe Christine, have a wonderful day! I did not know that we could increase the health benefits of garlic just by letting it sit for a while. The rosemary skillet potatoes look better than chips. Nice recipe! I have rosemary growing on my window sill and there are potatoes in the pantry. I already have most of the ingredients. Thanks for the recipe! I like rosemary added to patatoes very much! I love potatoes anyway, so I love these too! I am going to make these..I have two potatoes and fresh rosemary that are sitting waiting for me to do something with..Thanks for posting!! These potatoes look delicious. I put garlic in nearly everything. Have a wonderful day Christine. They look perfect! Thank you for the info on garlic! Thank you, MJ! I hope you enjoy. I did not know that about letting garlic sit--thanks for the information! Rosemary-garlic potatoes are awesome--I made some chopped last weekend, but I think I like your version better. There are few things I love more than potatoes and rosemary combined! Good tips! I didn't know most of that about garlic. These potatoes look delicious. I'd inhale them if they were in front of me. Yummy!! I so glad you all like the rosemary skillet potatoes. It sure was good. Thanks for all the amazing comments, I just love hearing from you. 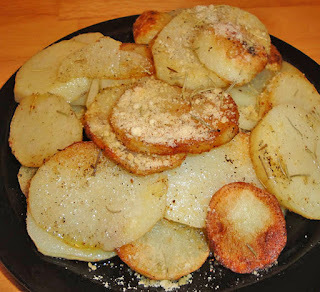 What a simple but delicious way of serving potatoes, Christine! Love it with lots of garlic powder and parmesan cheese! These sound so good, and I love that they are so simple! Rosemary is my favorite with potatoes! Just one more reason to love garlic!! I never knew that about garlic. I always thought eating it raw was the best way to go...not that I did that too often. There can't be too much garlic! Thanks everyone! Your comments are wonderful. Love hearing from you. Garlic is such an awesome powerhouse of a food! I add garlic to basically everything I make, regardless of whether the recipe called for it or not! These potatoes look delightful and so easy. A great quick weeknight side. I make similar potatoes with thyme but rosemary and cheese combination sounds good! Next time I try (this is pretty common recipe in our home too), I'll use yours. I know it will taste great! Thank you Nami! I hope you enjoy. I was home alone and wanted a healthy snack. I saw this recipe, so I made this today. Since I was home alone I only cooked one potato and cut back on rosemary and garlic. It was awesome! Love it. I will be making this for my family this weekend. Thanks for a great recipe. Love your site and recipes. This is one of my absolute favorite way to eat potatoes. I love how some of the potatoes get a little crispy while the others are super creamy, and the rosemary just permeates the whole thing. Yum! I can't have a potato without some rosemary or dill,looks great!